I'd love to see these two in an adventure together. While heroic, both have a savage side that sets them apart from their teammates. Wolverine is very long lived while Hawkman has been through many reincarnations, so they have both experienced a lot more in life than their fellow teammates. They even both utilize exotic metals with amazing properties to enhance their natural born abilities. Cool cover! Nice headshots! That's different. If you have not been reading the latest Hawkman series, let me recommend it. While I am not sure of the reveal of his one, true origin, the twist that he is re-incarnating across both Time and Space is interesting. He has been confronting his past selves for answers. In the latest issue he confronts his Kryptonian iteration. The one thing I do like is that Carter Hall comes across as an "Indiana Jones" type - finally! Oh, a few issues back Carter team-up with The Atom in the microverse. It was a fun read. You've hit some long-ignored nails on the head, quite accurately, Ross. 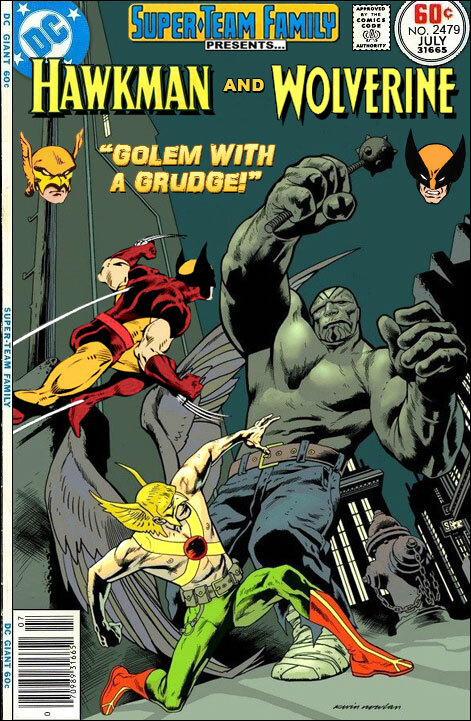 As to their mutual opponent on this cover; is this the same Golem that was introduced in a DC limited series some twenty-odd years back? Admittedly, I can only recall the first two issues of it. He was a Depression-era gangster's victim, reanimated Kabbalistically. Then, sort of inherited, sixty years later, by his lesbian granddaughter and her purple-haired, leotard-wearing girlfriend? Especially satisfying cover today. Thanks!! ITEM: I cannot identify the Wolverine figure, but I believe that the Wolverine head is by Paul Smith. ITEM: Y'know, they ARE some of the longest lived heroes in their respective universes, allowing reincarnation. THAT might be a fun team up; the "No Salvation from Old Men" super team up! These two, Uncle Sam, Thor and Hercules... just a thought, anyhow. ITEM: I HATE the "savage" Hawkman personally. I remember how he started, I remember his comic and his incarnations before the Crisis on Infinite Earths... he was an archaeologist and a police officer, neither of which lends itself to having a savage aspect. I am not fond of that change in the Winged Wonder. I agree with ELS regarding Hawkman's personality. When I first started reading JLA, Green Arrow picked on Hawkman for being so square. I like that Hawkman--archaeologist, police officer AND husband--better. Artists and writers. They don't like business people forcing their materialism on them. But, they feel no remorse in similarly forcing their "aesthetic visions" on the rest of us. This looks like a classic Bob Haney Brave and Bold cover. Well done! @Carycomic: yeah, that sounds about right.